The contents of sanitary bags depends on the appointment and qualification uses its medical staff. On the equipment of the military medical service has bags of nurse and bags of skinstructure. The medical bag contains medicines (tincture of iodine and ammonia in capsules, caffeine-benzoate sodium tablets), dressings (sterile bandages, dressings packages, small armbands and scarves and sticky patches), inventory items (bundles hemostatic, pins, scissors, garden knife, a notebook, a pencil). Bag skinstructure, in addition, contains petrolatum in a tube, terramycin and ftalazol tablets, antidotes, sterile cotton wool, tweezers, thermometer. The contents of sanitary bags are designed to assist 15 - 20 amazed and sick. In concrete terms Sanitary bag is equipped according to the situation and its contents may be more diverse personnel. Sanitary bag should be portable and spacious, does not constrain movements (creep, carrying the wounded and so on). Sanitary bag (Fig) made from canvas, front and back walls - hard (embedded thin sheets of plywood or cardboard), which gives it the necessary form and protects the contents from damage. The side walls soft, that allows reducing the volume during emptying. If necessary, on the bag, stretched rubber case. Closes sanitary bag wide semi-rigid changeover valve attached to the rear top and fixed on the front wall fastener. On the back wall outside, there is a strip - pad with the armhole for attaching to the belt. 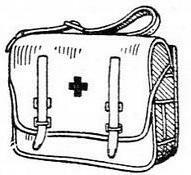 Wear a medical bag on the side on canvas strap, the length of which is controlled by the buckle. The weight of the bag 3-3,5 kg Besides these, there are other types of styling - San. bandoliers and San. schoolbags with content similar to the content of the sanitary bags. San. satchels, unlike sanitary bags, wearing on his back, and bandoliers - through the shoulder. Sanitary bags replenished the stock of battalion and regimental medical stations, medical battalion. Cm. Medical assistance (in the military field conditions).